Remnant carpet offers an inexpensive, versatile solution to hard-to-fit rug areas, especially if you are decorating on a dime. To give remnant a polished look, consider binding. While rug stores offer binding, it drives up the cost. Remnant carpet offers an inexpensive, versatile solution to hard-to-fit rug areas, especially if you are decorating on a dime. To give remnant a polished look, consider binding. While rug stores offer binding, it drives up the cost. Rug crafters have long been binding their own rugs, so take a trip to your nearby craft store and buy supplies to get a finished rug look without a big investment. Get a binding fabric color that matches your remnant, which gives you a professional look on your wrapped edges. 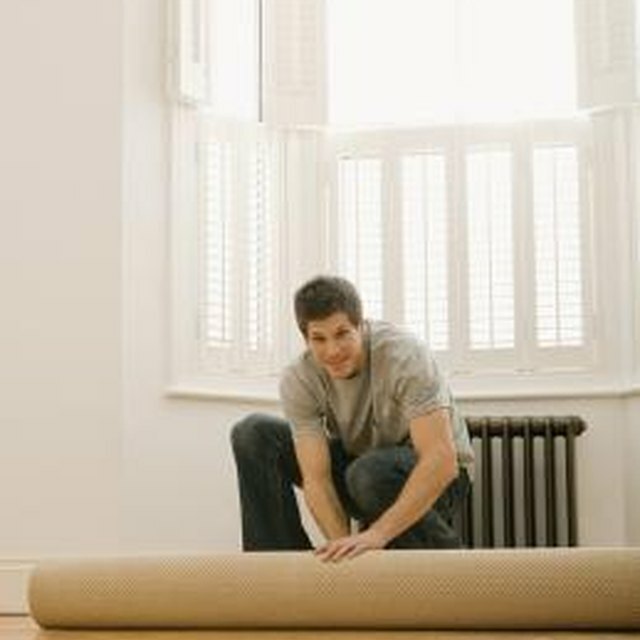 Measure the length of your carpet and cut a piece of binding fabric that will cover the rug. Plug in your hot glue gun to heat up, while you continue prepping. Lay your remnant on a piece of cardboard and trim the edge using a small knife, to get a clean working edge. If you have trouble cutting neatly, use a yardstick to help you get a straight edge. Lay the fabric next to your rug. Make a line of hot glue down half the rug binding fabric, stopping in the center. Fold the binding fabric over the rug and press to hold it in place, letting go after 10 seconds so the glue can dry. Apply the top half of the binding tape just like this. Work on the second side while the glue dries. Again, cut the carpet to get a clean edge, and cut the binding tape to the right length. Line them up, then hot glue one half of the binding strip at a time to your remnant. Complete the other two sides to finish binding your rug. You can also find iron on rug binding. This works the same way, except you use an iron instead of hot glue to apply the product. What Is Dog Eared Fencing?